Free subscriptions are available only to DPM's. 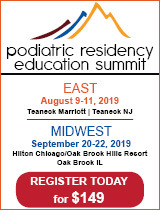 Students and non-podiatrists are welcome to subscribe at the rate of $38 per year or $54 for two years; if you would like a paid subscription, please do NOT fill out the form below. Click HERE to request a paid subscription. If you are ALREADY a subscriber to Podiatry Management and have either changed your address within the last six months or are about to do so--please do NOT request a NEW subscription; instead, click HERE to fill out the CHANGE of address section."